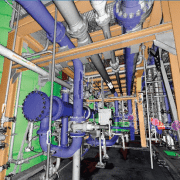 PITTSBURGH, PA — 06/15/09 — Quantapoint (http://www.quantapoint.com) — provider of laser scanning technology and services that help companies achieve Zero-Defect Projects™ — today announced that Quantapoint Laser Models™ may be accessed directly in Intergraph SmartPlant 3D using QuantaCAD 9.0. QuantaCAD enables 3D laser scan data to be accessed as high-definition Quantapoint Laser Models™ (not fuzzy “point clouds”) and photo-realistic Laser Images™ directly within design software. -- Direct Integration: A separate "point server" is not required due to the smaller size of the Laser Models. -- State Manager: Store and recall the laser data state (loaded Laser Models, Laser Images and views) so users can quickly resume work instead of having to manually reload laser scan data. -- Tag Points: Create and edit tag points (specific 3D locations, such as tie points) directly in the laser data so users can access consistent design starting and ending points across the team. -- Clipping and Slicing: Clip laser data to temporarily hide view obstructions or slice it to create a section of laser data. -- Demolition: Demolish areas of the facility being removed in the laser data to remove it from view. -- Flexible Licensing: Quantapoint software are now integrated and may be licensed monthly for standalone or network usage, providing more flexibility based on project or program needs. By using QuantaCAD to put reality on the desktop and in design software, clients have typically been able to reduce remodeling time by 85% (by using Laser Models instead of CAD remodeling or as a basis to remodel), decrease design time by 60% (by accessing more complete and clear Laser Models and Laser Images for design) and cut rework from design clashes by 85% (by correcting clashes between the Laser Models and the new CAD design). If you are interested in finding out more about accessing laser data in SmartPlant 3D using QuantaCAD 9.0 or would like a demonstration, visit www.quantapoint.com/qp/contact or e-mail info@quantapoint.com.